In Minnesota's three-way race for governor, my candidate is Mark Dayton, the Democrat. The Republican, Tom Emmer seems a little dim and thuggish. Tom Horner, the Independent, is bright and fair-minded, but adamantly centrist. Born in 1950, his career has been as reporter for suburban shopper-stoppers, press flack for former Republican Senator Dave Durenberger, press agent, and university communications perfesser. Eschewing radical solutions, and groomed as somebody who could run for governor, he represents the discredited, square paradigm. I never got high with this guy. Dayton, a department store heir, formerly married to a Pillsbury, is a child of privilege who wants to increase taxes on the privileged. He recognizes that the money -- and a lot of it -- has to come from somewhere, but the thing that persuades me is his privilege. This guy has had the leisure to think about something besides a political career. Usually, I'd be happy to send the richest candidate to Terra Haute for the Indiana hot shot, but if one of these characters understands the Whole Earth/CoEvolution take on intervening in the system we laughingly call our society, it's Mark Dayton. And he's been State Auditor. 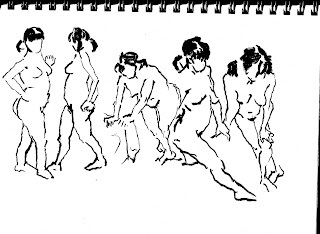 Five gestures of Jill. I used a brush, which had the contrary effect of making these quick studies less elegant.